Brands you love. Reviews you trust. 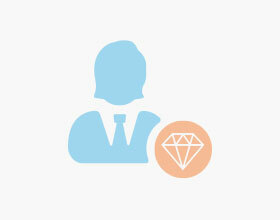 Select keywords to find your Jeweler. Worst service ever! Workers didn't greet customers like other locations do. You lost a customer today due to an incompetent worker that turned me down just because I was estimating a ring size for a gift. Worker specifically said, I will not help you if you don't know the ring size and rudely walked away. Excellent service with ADA CHIU she helped me to find my first TAG watch i will definitely come back to her. Thank you Uno de 50 for coming to Canada. I first started buying unique jewelry at their stores in Spain, many years ago when they started. Love the unique and edgy design. It’s so hard for some companies to break into the Canadian market. I hope Uno de 50 does survive in Canada...not sure Canadians can handle this amazing brand. I went in for a repair on my engagement ring and it was a great experience. The team was very knowledgeable and helpful. My friend who tagged along said that she'd come here to get her ring in the future as well. Definitely recommend! Great merchandise, the men's jewelry is on point. But only purchase if you're 100% sure you're going to keep it, NO REFUNDS, CREDIT ONLY. I asked before hand as it was a gift and the associate said it could be returned for a refund. The intended recipient of the gift wanted something else and I attempted to get a refund and was told "it's printed on your receipt" and "I''m positive she wouldn't have said that". Liars! Great service. The staff is very professional. I went into the store today and was greeted by Chris and Amaris. They were very friendly and knowledgeable. They helped me by providing great suggestions based on what I was describing. In the end, I had a great experience shopping there. The store was clean, organized. Lighting was good, selection is complete. Good representation of what the brand stands for. The jeweler unilaterally decided that he would upsize the size of diamonds in my wedding band and charged us accordingly. The ring neither was tasteful, nor did it fit my engagement ring well. They only offered a refund on this after we were fairly assertive about it, and insisted on having a band consistent with our original request. The whole process took around five months. The only part of the experience I could give five stars to was Gina. Gina is the most amazing salesperson (and gemologist) you could ask for, and she has amazing taste and knowledge. I wish I had met her at a different jeweler, because she was fabulous. Don't bother looking elsewhere. You will find the best quality, price and customer service here. I am picky and wanted a very specific engagement ring. Andreas was never pushy and went out of his way to accommodate my specific design requests. We of course went back to get our wedding bands for here and they were just as perfect as my engagement ring. Most jewellery stores provide you with a very impersonal experience, and we have not experience the level of care and attention we received at Diamonds For Less anywhere else. This place is a gem! I wanted to thank you both Anar and Anju for this beautiful milestone in my life. You have made something that is uncomprehendable to me into something easier. Showing me the steps and things I needed to get in order to make a horrendous day in paradise into something as lovely as the ring. I appreciate the time and countless emails and phone conversations that we had went through to find the most perfect diamond within my budget. When I first sought out this endevour I was so worried but your patience, insight and help made the purchase so smooth I couldn't have asked for more. My new chapter of my life starts now thanks to you both. Without you I may still be shopping for the perfect diamond. Thank you both for your time spent, your insights were tremendously helpful and constant contact when something came up was nothing short of the perfect experience. Thank you both again for all your help through this hard time to make it simple as it can be. By far the best choice for anything engagement-ring related. The entire experience--starting from the initial appointment, ring design and confirmation, final product, even the resizing and follow-up was nothing short of perfect. Every step was incredibly transparent, professional, and very quick as well--something you might expect from a business that books weeks out in advance, given the popularity (so be sure to book early). I was able to design & purchase the exact ring I had in mind for a much more reasonable price than any other vendor (retail), and was well within budget--absolutely no complaints. Alexis is amazing. She is warm, patient, talented and easy to work with. She was always very prompt and available for questions. I had a vision for my ring and she made it come alive. My fiancee and I could not have asked for a better experience... or a better ring! Great service and extremely helpful. I recently purchased a pair of Diamond and Pearl earrings from Mani Jewelers. The gentleman that assisted me was knowledgeable and very patient. Their selection is vast which made it a pleasant shopping experience. Thanks again! Agree with the review below. Great staff, knowledgeable, friendly and provide great service. Please consider Fine Casting for your needs before going to places like ready mounts (rude staff, overpriced).